The Tailored Sportsman is clearly a beloved brand among the Hunter and Equitation riders of today, and who can blame them? TS tops are buttery soft and breathable. The breeches come in every color under the sun with the iconic vintage knee patches. 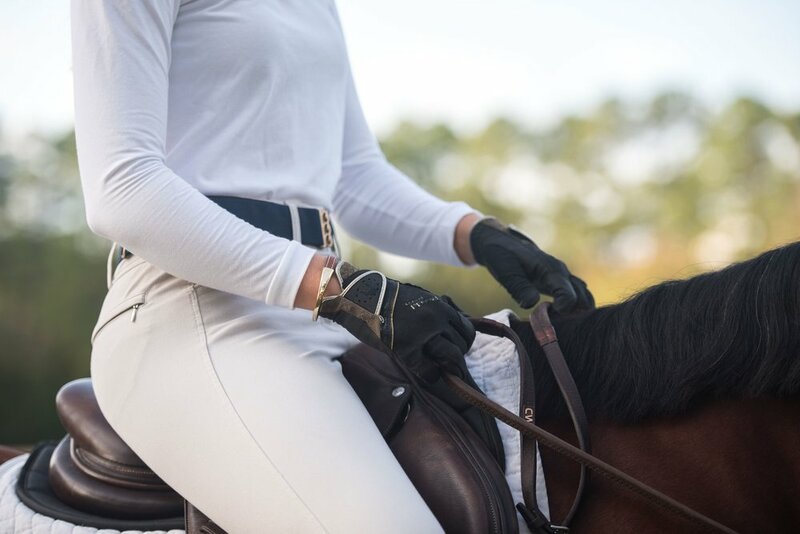 The Tailored Sportsman has been the riding habit staple for decades! While this is the case, I often receive requests on how to pair a certain Tailored Sportsman item with another, and I'm here to tell you you can throw the misconceptions of conventional matching out the window! 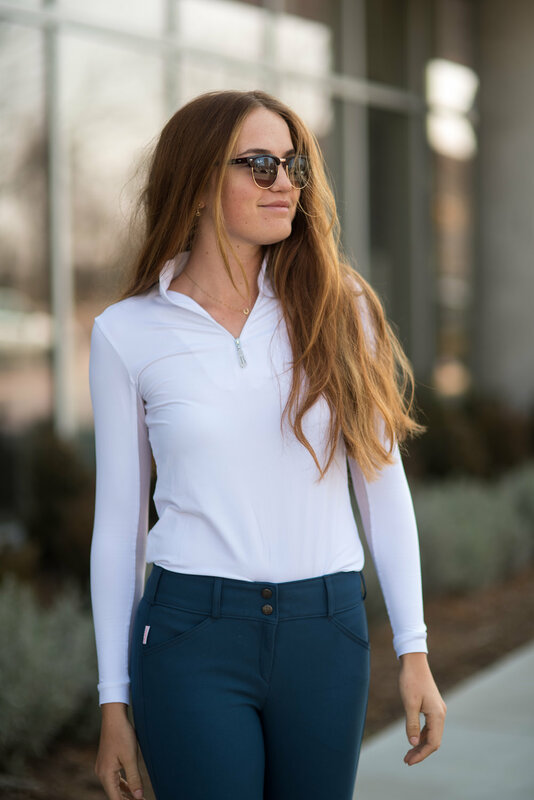 KAVAL carries the most relevant and up to date colors that you can virtually pair any TS top with a pair of breeches KAVAL has. Or are you on a budget? I'll show you the best Kaval TS colors to go with everything in your current wardrobe. But don't take my word for it; keep reading and I'll prove it! In the equestrian industry today, I believe we have gotten a bit too conservative with our matching habits. For instance, you may own a pair of gray breeches and whenever you wear them, only two potential tops come to mind as potential "matches." Well I'm here to tell you that with KAVAL's Tailored Sportsman color selection, your pair nearly every color combination together. Still not convinced? Let me start by showing you the KAVAL x TS colors that- I promise- will go with everything you already own. Let's start by the obvious: The Tailored Sportsman Trophy Hunter Tan Breeches. In the Hunter/Equitation world, these tan breeches are an absolute must in your riding wardrobe. KAVAL carries the classic tan TS Trophy Hunter in a front zip low rise (pictured here) as well as a side zip mid rise. The zip and rise is completely based on your comfort and style preference, but as of right now, the front zip low rise is most popular. This pair is equally great for at-home hacks and entering the show ring, which makes it an obvious first purchase if you have a specific budget. Another great thing about this tan? It goes with every single TS top KAVAL offers. Go ahead- go on their Tailored Sportsman selection and I dare you to find a TS top these breeches won't match beautifully with! If you are able to buy three TS tops, these are the three to start with. If only two, I'd go with this TS white top and either navy or black depending on which you color you enjoy wearing more often. My absolute favorite color? May sound boring, but it would have to be white if I could only purchase one! It goes with everything; keeps every look crisp and classic; and surprising machine washes very bright and clean no matter what messy situation I get myself in at the barn. These three colors shown above go with black, navy, gray, hunter green and the brighter colored breeches KAVAL carries. You truly cannot go wrong! These two pairs of colored breeches are some of my go-to's as far as breeches are concerned. I don't typically wear flashy breeches colors, but when I'm looking to add a little color to my look, these are two pairs that I always gravitate towards because they are so versatile. I've worn the gorgeous green-gray Rosemary color with white, black, navy, blue, tan/camel, mint/aqua, maroon/burgundy, brown and ivory tops and belts. I've styled the muted blue Bluesy breeches with all of those Rosemary color pairings plus some reds, orange, yellow, other shades of blue and purple. If you are pairing TS colored breeches with a TS colored top, I usually go with a basic leather belt in black or brown. Do you own a few TS colors that are tricky to match? Click HERE to sign up for my totally free KAVAL x TS Matching Guide! 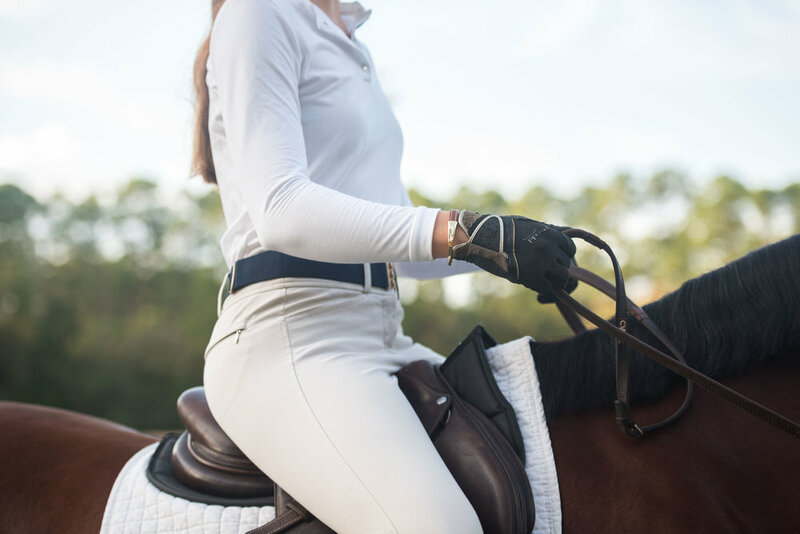 In this post: Styled images by My Equestrian Style, Stock images by KAVAL Inc.
Zyia Active is a fantastic brand that I’ve previously raved about, but it isn’t just for the gym! 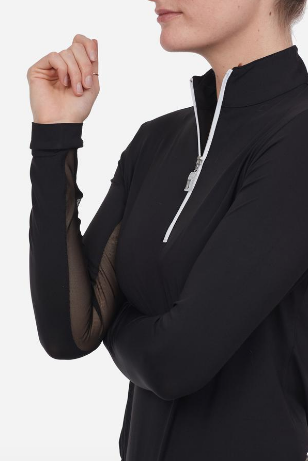 I love this Zyia active top because it fits like a glove while still being super breathable. This gray color also goes with everything! I love it with my RJ Classics green breeches and gray Shop ECE woven belt. Classic. Functional. Super cute. My order came with my favorite kind of hair ties with the Zyia logo. Even with my massively thick hair, I love using this hair tie and throwing my hair up in a top knot or braid after it’s been in my helmet. And who can resist thumbholes?! This top is great for hot weather but also amazing as a layering piece. I wear this under a crew neck sweater and a vest and it’s ideal for sub 40 temps. Zyia supports every kind of active lifestyle and is one of my few exceptions for non-equestrian brands for riding. You should go check out all of their styles! Something about the Target balls in the front of the store always make me happy. Maybe that is because I go into the store and buy everything in sight? Regardless, they matched my red Valentine's insipired look! I received this wonderful practice top by Red Scarf Equestrian that is a brilliant white with red mesh and zipper details. I love how classic the color combination is. It looks great with navy and is awesome with black; today I wore this top with grey. I love it! The material is super soft and breathable. I paired this top with a fantastic Lotus Romeo jacket I got from Tack N Rider. The lines on this thing are insane! I love collar and boldness of the color block. Just a brilliant piece! I threw on a pair of TS breeches and finished the #ROOTD with a C&C Signature leather belt that is such a staple and a go-to in my ever-growing belt collection. This look was so fun and while it is great for Valentine's week, each of these pieces are excellent for year round. Click the links in this post to shop and treat yourself this week!! A little bling never hurt nobody, right? I am a firm believer of less is more, but every once in awhile I am cool with a little sparkle. Paragon Equestrian designed this subtle but glam 1/4 zip top and I think it is super cute! I love the mix of athletic and feminine, not to mention how this top goes with everything! This Paragon Equestrian Luxe Technical Base Layer has a four way stretch with mesh inserts and thumb holes. The crystals along the front zipper add a fun and girly element as well! The logos are apparent but subtle- I love the placement on the back. As I said before, this top could go with just about everything. For this look, I paired it with a pair of light tan breeches, black loafers and a black blingy belt by Ellany Equestrian. I think this #ROOTD is simple yet makes a big statement! This baselayer is also perfect for an off duty ensemble; it's great with leggings or a pair of jeans. Paragon Equestrian just came out with some new styles in their Valentine's Day Edit, and I have one more PE look up my sleeve so stay tuned for that! I figured out I probably ride roughly 30 times per week and I used to ride upwards of 60 times. From a riding perspective, this amount of time in the saddle keeps me strong, but it also makes it pretty easy for me to develop habits quickly. This is why every ride must be executed with a plan in place. I usually go through similar routines and procedures to keep my rides consistent and covering all the bases. For example, if I am staying extra disciplined, I will do all of my lateral work at the walk, trot and even canter on all of my horses. This helps me easily check off my mental checklist so that when I hop off every horse, I know I helped that horse become more responsive, straight and supple for his/her owner. From a fashion perspective, all of those rides mean I must be very intentional about what I wear. I remember when I was younger I could get away with two or three pairs of breeches and I could even go two days without washing a pair. Now, nearly everything I wear to the barn comes back unrecognizably dirty and well worn. I can wear through a pair of breeches very quickly, so it's important to have cute riding attire that is also mega durable. A brand that absolutely stands out for me is Sakkara. 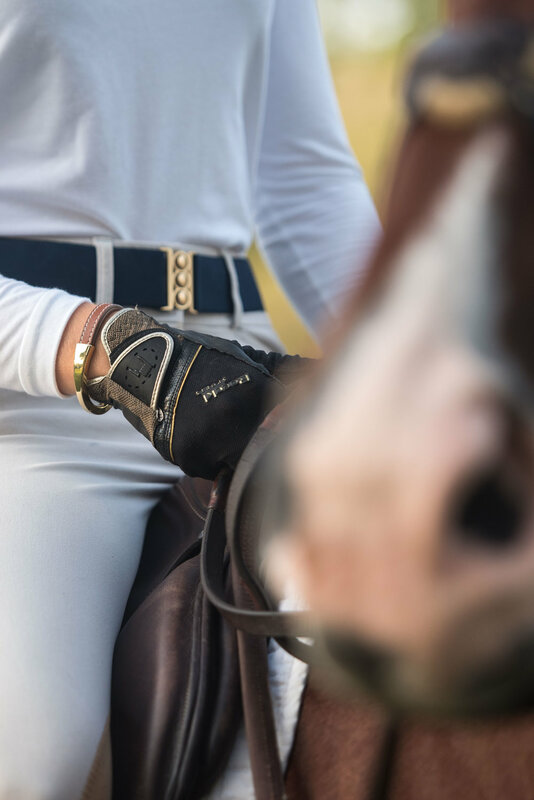 If you know me at all, you already know I rave about this Egyptian designed, Italian made, American based equestrian line. The breeches feel like a second skin. This Pura Top is breathable and buttery soft. The belt is just my favorite belt ever- I've said this once and I'll say it again- if I designed my ideal belt it would be this M Belt. The fabrics are somehow durable, luxurious and athletic all in one. I think Sakkara has really hit the nail on the head when it comes to high equestrian fashion and overall functionality. This look is definitely a go-to and I think you should give it a try, too! Click here to visit their website and stay tuned for a FABULOUS giveaway coming up in a few weeks!! Solid bomber jackets are hard to come by. Huntsmen and Hounds has this fantastic piece that is functional like a jacket but soft like a sweater! This bomber comes in the gorgeous mulberry color I have but also a really nice blue you can see on their website. One of my favorite features of this item is the awesome leather pull on the zipper! I got a size small which makes this jacket true to size. I wanted it pretty fitted so I could still ride in it. Here I have it styled with a Lotus Romeo show shirt (that I got from Tack N Rider - Wellington) which I love as a pre-show look to wear in the mornings while it is still chilly. It's ideal for the cooler temps when a small sweater or pullover just won't do. I also wear it at home under practice shirts for added warmth. This is also the easiest piece to transition to your daily wardrobe. It is very versatile and definitely a jacket I gravitate toward when putting a look together! Check out their items online here. This is my first Florida summer and every time I tell Floridians that, they groan and warn me of my upcoming misery. So far, it's been fine, but what is most annoying are the daily downpours! Now I know why people in Florida really value a covered arena. I have to keep reminding myself, "Bethany, you're not in Southern California anymore." Thankfully, I have a fashion solution and it starts and ends with Pikeur. I love this rain jacket so much. It is versatile, matches everything, and has so many zippers and pockets. I keep this jacket in my car at all times because it is my go to during my rainy rides. Did I mention it has a great hood? I hate it when jackets have hoods that look so odd when they are up, but this one is perfect. I love that it has tightening fasteners for when it is really pouring. So again, thank you Pikeur for a fabulous rain jacket, it will always be a staple in my equestrian wardrobe. I don't know what it is about peplum tops that I like most: that they are perfect layering piece... or that they are super flattering no matter what you ate for lunch! Now of course there are sweaters, jackets and vests to add to the mix, but I think these are the four base outfit combinations! I love that I can wear all of the random cropped sweaters that I didn't really know how to wear in a riding outfit before. I also can really appreciate that this peplum top is made out of a clima-cool material, so when the weather gets too toasty, you just peel off your cropped sweater! 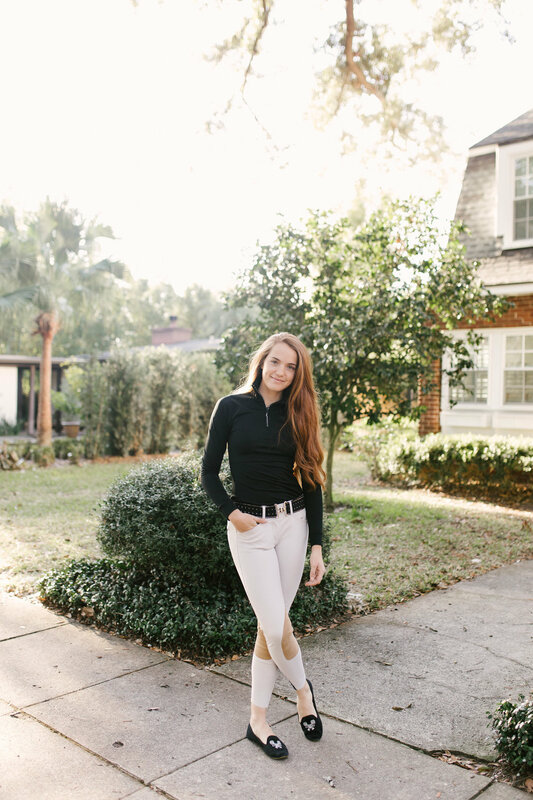 I would love to find a peplum top that has two lower layers: one top layer that ruffles and one under layer that lays flat and can be tucked into breeches; that way, when you are trotting, cantering or jumping, you're not flashing your back or belly all day long. So if anyone knows of any peplum top like that out there, help a sister out!! When it is all said and done, I think this low rise breech/peplum top/cropped sweater is super fashion forward while still being functional. Click the links below to shop a similar look!